Limited collection! Vintage Vixen Keyhole denim leopard pencil dress from Miss Candyfloss. 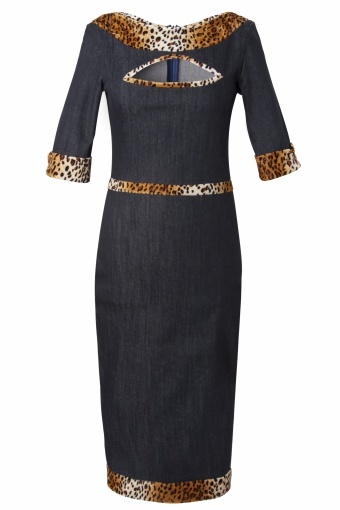 Grrrr.... edgy stretch denim pencil dress with soft leopard teddy trims and half sleeves. Backside blind zipper and small slit. Unique dress with stunning detailing like the leopard trims and keyhole neckline. The trims on the back accentuate your curves (yes really! ), the firm stretch denim holds you in while hugging your curves! Pare them with a glossy red pump and a vintage vixen is born! This dress looks in real much better then on these pics. Model wears the handmade Fascinator from Miss Candyfloss.